The so-called "supercommittee," a bipartisan group of legislators, that was supposed to reach an agreement on how to reduce future deficits has failed. This failure thrusts the much-contested Bush tax cuts and U.S. military spending, which has almost doubled to roughly $700 billion since 2001, into the forefront of next year’s presidential campaign. Why was the supercommittee doomed to fail? Mainly because the gulf between the Democratic and Republican parties is so wide. Republicans believe that the $2.5 trillion in tax cuts Pres. Bush enacted from 2001-2007 aren't enough. Republicans believe additional tax cuts for corporations and the wealthy, further slashing to all government spending, including Social Security, Medicare and Medicaid, and further increases to military spending will reduce the federal deficit and create jobs. The negotiating position of Republicans on the supercommittee was that Democrats must agree to privatize Medicare, or there could be no budget deal. Democrats see that the trillions of dollars of tax cuts already given to corporations and the wealthy, plus the increase of annual military spending from $379 billion to roughly $700 billion over the past decade has created the massive federal deficit and it's time to abandon that failed Republican ideology. During his eight years in office, President Bush also oversaw a largest increase in government spending of any of the six presidents preceding him, including LBJ. In his last term in office, President Bush increased discretionary outlays by an estimated 48.6 percent. In eight years, President Bush increased federal spending by a whopping 104 percent. A report released in April 2011 by SIPRI reveals that annual U.S. military spending almost doubled from $379 billion (3.1% of GDP) in 2001 to $669 (4.8% of GDP) billion for Pres. Bush's last fiscal budget of 2009. Under Pres. Obama annual U.S. military spending increased to $698 billion in 2010. 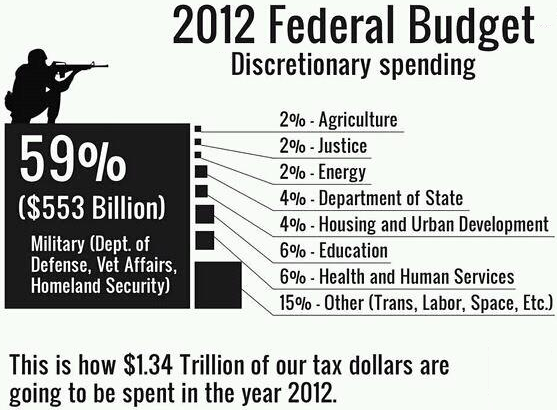 U.S. military spending equals the combined military spending of the rest of the world. U.S. military overspending has led to a "civilian / social service" deficit -- including under-investment in infrastructure, education, and health care -- and as consequence, the economy has suffered, resulting in lower GDP growth. U.S. infrastructure is crumbing -- bridges are falling, highways/roads and public transit systems are in disrepair, water and sewer systems leak. Airports are woefully inadequate or in need of renovation. The electric grid must be upgraded. Along with increased funding for education and basic research, schools need to be rebuilt, as do many hospitals. Health care services must be expanded. In short, the civilian / social service deficit has resulted in a nation with fewer skills and without the state-of-the-art infrastructure needed for commerce to flourish, and the U.S. economy has suffered -- GDP growth is below where it should be. Further, the unemployment rate is high. And most recently, social unrest has started to surface in the Occupy Wall Street protest movement. Overspending on defense is weakening the United States' economy and, by extension, is decreasing the nation's power relative to other, major powers and nations. And the United States will continue to weaken, if it does not substantially reduce its defense spending. Every Republican running for office in 2012, from the Presidential candidate to Senate candidates to House candidates, will have to defend why they want to increase, rather than decrease, military spending over the next 10 years pay for those increases by cutting Social Security, Medicare and Medicaid. The supercommittee failure also starts the clock running on the Bush tax cuts, now scheduled to expire in December 2012 - one month after the November 2012 presidential and congressional election. In 2001 and 2003 Pres. Bush asked congress to pass roughly $2.5 trillion in tax cuts to stimulate the economy. The outcome of Pres. Bush's 2001 tax cuts was "the weakest employment growth in decades." Republican tax cut legislation that Pres. Bush signed in 2004 didn't fare much better, with resulting job creation well below historical averages. When Bush's White House proposed the 2003 tax cuts Republicans promised that it would add 5.5 million new jobs between June 2003 and the end of 2004. But by the end of 2004, there were only 2.6 million more jobs than in June 2003. And, remember President Bush's February 2008 promise that his newest $168 billion tax cut/rebate economic stimulus plan would stave off economic recession and massive job losses? Wrong again! All the Republican "job creation" promises over the last decade have been broken. The Bush tax cuts will cost about $4 trillion over the next decade, if they are renewed after the 2012 election. Every Republican running for office in 2012, from the Presidential candidate to Senate candidates to House candidates, will have to defend why they want to not only reauthorize the trillions of dollars of Bush tax cuts, but give millionaires and billionaires even more tax cuts and pay for those tax cuts by cutting Social Security, Medicare and Medicaid. The Republican Party endorsed Rep. Paul Ryan’s (R-Wis.) sharply conservative 2012 budget bill when all but four Republicans in the U.S. House voted for and passed the bill before the 2011 Easter recess. Ryan's Republican budget eliminates Medicare, as it exists today, and guts Medicaid as well as the rest of the government. The budget also gives additional huge tax cuts to millionaires and billionaires plus further big corporate taxpayer handouts to pharma, insurance and petrochemical industries. The Republican budget explodes deficit spend in the near term and doesn't actually balance revenues and spending until the year 2040. If Republicans retain control of the U.S. House, regain control of the U.S. Senate and win the White House in 2012, America can expect to see Ryan's Republican budget enacted in 2013. Every Republican running for office in 2012, from the Presidential candidate to Senate candidates to House candidates, will have to defend supporting or voting for the Ryan Budget bill. The Progressive plan not only protects and strengthens Social Security and Medicare for decades to come, it puts America back to work through infrastructure and highhttp://www.blogger.com/img/blank.gif tech investments.